Clarify your message. Connect with customers. Grow your revenue. Do you feel overwhelmed when marketing your business? Does your social media fail to get engagement? Are you ready for a marketing makeover? A Marketing Plan Should Grow Your Revenue, Not Your Frustration. A clear message tells customers about your product or service offer using simple words. Customers will understand faster so you’ll spend less on marketing. A clear message tells customers how your product or service makes their lives better by solving their problems. Customers will listen to your message then and only then. A clear message tells customers how they can do business with you in 3 easy steps. Add clarity. Subtract confusion. Increase sales. It’s that simple. We’ll start by reviewing your website, social media, or your marketing strategy. We’ll use the StoryBrand marketing framework to create a clear message so customers will listen across all of your marketing channels. We’ll discuss how we can work together to implement a clear marketing plan, website makeover, or social media plan. We’ll identify what works best for your business and budget. A clarified message will benefit your business immediately. You’ll see how easy it is to market your business and increase your revenue without feeling overwhelmed. 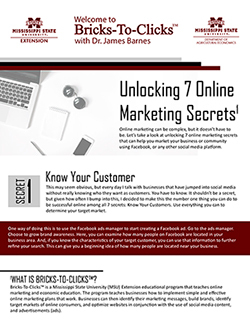 Dr. James Barnes is director of the Bricks-To-Clicks program and has helped hundreds of companies implement marketing strategies that grow revenue. The program delivers easy-to-use marketing tools that are understandable and easy to implement in your business immediately. 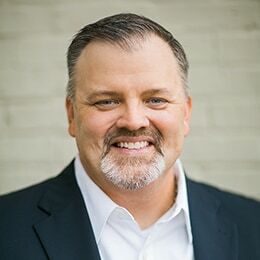 Dr. Barnes is a StoryBrand certified marketing guide and copywriter who has the expertise to help you grow your revenue. What Makes the Bricks-To-Clicks™ Marketing Program Different? Most business leaders feel overwhelmed when they market their business so we created easy-to-use marketing tools. When marketing works, your revenue grows. At Bricks-To-Clicks™, we understand the importance of marketing your business to grow revenue. In order to do that, you need to market your business without feeling overwhelmed. We believe there’s a simple way to use marketing tools to grow your revenue. And we understand that marketing your business can overwhelm you, easily. From websites to keeping up with social media, marketing can be complex. That’s why we created the Bricks-To-Clicks™ marketing program so that you can give your website or social media a makeover, or you can create a new marketing plan from start to finish. We’ve helped hundreds of business owners just like you implement marketing tools to grow their revenue. So, register for a webinar, download some of our FREE marketing resources, or schedule a call to start implementing your marketing makeover today. And remember, the only way you eliminate feeling overwhelmed is to prepare, prepare, prepare. If you don’t take action, you’ll continue to lose sales, waste money on marketing, and eventually lose to the competition. The cost of inaction is already costing you a great deal. But you can change that. Schedule a call to get started and implement one or all of these tools to grow your revenue. His knowledge of all social media platforms allows us to create an action plan that drives sales! This is a great program for any farmers market or agribusiness that wants to maximize their return on social media advertising! Working with Dr. Barnes is a treat! He is patient and makes sure you understand the process and can take ownership of the new skills learned. I highly recommend Bricks to Clicks to any organization or business. Dr. Barnes has been so helpful in improving our social media presence and helping us decide what works best for our company. We have benefited greatly from the time we spent with him! Dr. Barnes is extraordinarily knowledgeable of social media marketing and is a gifted instructor. Dr. Barnes' Bricks to Clicks has been an important part of MDA's Asset Development workshops around the state. Dr. Barnes is very knowledgeable about social media marketing! Bricks to Clicks has successfully provided vital business development support to our Mississippi agribusinesses and rural entrepreneurs. We can now strengthen our network of specialty crop farmers and improve the economic landscape of poor rural communities because of your training. Discover 7 Online Marketing Secrets To Grow Your Business Today!